I don’t normally review the comics I read as my reviews are usually bore fests. But just after reading the new Starfire comic, I just needed to let the world know that this comic is absolutely great and anyone who loves the character should be reading it. Luckily, you don’t have to worry about missing anything as the book gives you all the information you need at the beginning and seems to be ignoring Red Hood and the Outlaws (thank god). 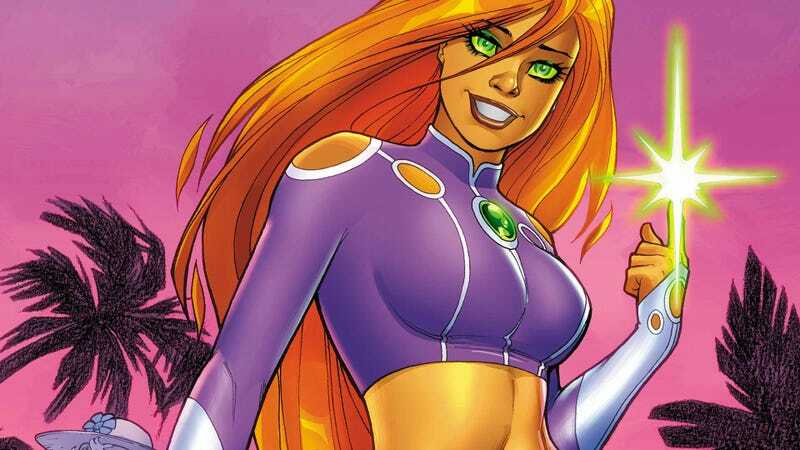 Personality wise, this Starfire is far more naïve then her Pre-reboot counterpart and share many of the quirks that her animated counterpart has. She is still incredibly likeable, think Pinkie Pie merged with Data from TNG to give you some sort of comparison and is fun to read about. One thing I loved is that Starfire struggles with understanding sarcasm, something I can fully relate to as even now, I can struggle with it. It doesn’t come across as her being dumb and it helps builds the growing friendship with new character Stella. Plot wise, it’s pretty much Starfire get the help of a Sheriff named Stella to find a job and a place to live. Shenanigans happen throughout the day as Starfire accidently causes a bar fight and mistakes putting $3000 in the bank for burring three elephants in a river bank. The story ends with her find a temporary home, but during the night, a massive storm hits and X’Hal blasts her way into their shelter. There are a few negatives to the comic such as there being some unnecessary fan-service near the end (odd given the intended demographic for this comic) and Starfire can be a bit too clueless in a few scenes for my tastes. But it doesn’t detract greatly from the comic but your own opinions may vary. Some of you may know that Starfire is my second favourite comic book character (first being Cassandra Cain) and someone who was very inspirational to me when I was a kid. It’s why I was so sad to see what happened to her at the start of the new52 as they basically stripped her of everything that made her such a great character. Thankfully, this comics gives us what we wanted and has brought much of what was lost of the character. A good read for any comic book fan and a must read for Starfire fans.